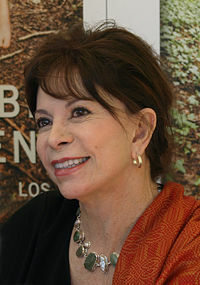 Isabel Allende Llona, (born in Lima, Peru; August 2, 1942), is a Chilean-American novelist. Allende, who writes in the "magic realist" tradition, is considered one of the first successful women novelists in Latin America. Allende is noted for her considerable contribution to Latin-American literature, with such novels as The House of the Spirits (La casa de los espíritus (1982) and City of the Beasts (La ciudad de las bestias) (2002). Her novels are based in part on her own experiences; she often focuses on the experiences of women, weaving myth and realism together. She has lectured and done extensive book tours and has taught literature at several US colleges. She met her second husband during a trip to California in 1988, and became an American citizen in 2003. Allende's style is associated with Magic realism, an artistic genre in which magical elements or illogical scenarios appear in an otherwise realistic or even "normal" setting. The characters' reactions to the "inexplicable" is key to the definition of magic realism: inexplicable phenomena occur in extremely mundane circumstances and the character(s) tend to not respond adequately (or at all) to the supernatural or magic nature of the event. On the contrary, they often treat the magical event as an annoyance, a setback, or an unwanted obligation. This blasé response to the supernatural is what distinguishes magic realism from other more traditional representations of magical phenomena in narrative fiction. It is also what gives magic realism its characteristically ironic and humorous quality. Allende was born in Lima, Peru to diplomat Tomás Allende, the Chilean ambassador to Peru, and Francisca Llona Barros. Tomás Allende was the first cousin (with Isabel thus being first cousin, once removed)   of Salvador Allende, the President of Chile from 1970 to 1973. Many sources also cite Isabel as Salvador Allende's niece, although most, if not all of these sources, do not state the relationship between Salvador and Tomás. (In Spanish, the words "tio" and "tia" refer equally to the siblings of one's parents as to the cousins of one's parents. So, according to family genealogy in Spanish culture as opposed to English, Isabel Allende is, indeed, the niece of Salvador Allende.) In 1945, after Tomás's "disappearance", Isabel's mother relocated with their three children to Chile, where they lived until 1953, moving briefly to Bolivia, then Lebanon. The family returned to Chile in 1958 so that Allende could complete her secondary education. Allende attended a number of private schools in Lebanon and Chile and was also briefly home-schooled. The young Isabel also read widely, particularly the works of William Shakespeare. In Chile she met her first husband Miguel Frías, whom she married in 1962. Reportedly, "Allende married early, into an Anglophile family and a kind of double life: at home she was the obedient wife and mother of two; in public she became, after a spell translating Barbara Cartland, a moderately well-known TV personality, a dramatist and a journalist on a feminist magazine." From 1959 to 1965, Allende worked with the United Nation's Food and Agriculture Organization in Santiago, then later in Brussels, Belgium, and elsewhere in Europe. For a brief while in Chile, she also had a job translating Romance novels from English to Spanish. However, she was fired for making unauthorized changes to the dialogue of the heroines to make them sound more intelligent as well as altering the Cinderella endings to let the heroines find more independence and do good in the world. Her daughter Paula was born in 1963. In 1966, Allende returned to Chile, and her son Nicolás was born there that year. Reportedly, "the CIA-backed military coup in September 1973 (that brought Augusto Pinochet to power) changed everything" for Allende because "her name meant she was caught up in finding safe passage for those on the wanted lists" (helping until her mother and stepfather, a diplomat in Argentina, narrowly escaped assassination). When she herself was added to the list and began receiving death threats, she fled to Venezuela, where she stayed for 13 years. During a visit to California in 1988, Allende met her second husband, attorney Willie Gordon. In 1994 she was awarded the Gabriela Mistral Order of Merit–the first woman to receive this honor. In 2003, Allende obtained United States citizenship. Most of her family took up residence near her in San Francisco with her son living "with his second wife and her grandchildren just down the hill; her son-in-law and his family live in the house she and her second husband, San Francisco lawyer and novelist William Gordon, vacated." In 2006, she was one of the eight flag bearers at the Opening Ceremony of the Winter Olympics in Turin, Italy. Beginning in 1967, Allende was on the editorial staff for Paula magazine, and from 1969 to 1974 for the children's magazine Mampato, where she later was the editor. She published two children's stories, La Abuela Panchita (Grandmother Panchita) and Lauchas y Lauchones, as well as a collection of articles, Civilice a Su Troglodita. She also worked in Chilean television production for channels 7 (humorous programs) and 13 from 1970 to 1974. As a journalist, she once sought an interview with Pablo Neruda, the notable Chilean poet. Neruda declined, telling her she had too much imagination to be a journalist, and should be a novelist instead. He also advised her to compile her satirical columns in book form. She did so, and this became her first published book. In 1973, Allende's play El Embajador played in Santiago, a few months before she was forced to flee the country due to the coup. In Allende's time in Venezuela, she was a freelance journalist for El Nacional in Caracas from 1976-1983 and an administrator of the Marrocco School in Caracas from 1979-1983. In 1981, when Allende learned that her grandfather, aged 99, was on his deathbed, she started writing him a letter that later evolved into a book manuscript, The House of the Spirits (1982); the intent of this work was to exorcise the ghosts of the Pinochet dictatorship. The book was a great success; Allende was compared to Gabriel Garcia Marquez as an author of the style known as magic realism. In January 8, 1981, I was living in Venezuela and I received a phone call that my beloved grandfather was dying. I began a letter for him that later became my first novel, The House of The Spirits. It was such a lucky book from the very beginning, that I kept that lucky date to start. Allende's book Paula (1995) is a memoir of her childhood in Santiago, and her years in exile. It was written in the form of a letter to her daughter Paula, who lay in a coma in the hospital in Spain. Paula suffered from a blood disease porphyria and during a crisis she fell into a coma then vegetative state due to a medication error while the hospital she was in was on strike. She was severely brain damaged and her mother took her to California where she died a year later in 1992. Reportedly, "Allende's impact on not only Latin American literature but also on world literature cannot be overestimated." The Los Angeles Times has called Isabel Allende "a genius," and she has received many international awards, including the prestigious Dorothy and Lillian Gish Prize, granted to writers "who have contributed to the beauty of the world." She is also the founder of the Isabel Allende Foundation, which is "dedicated to supporting programs that promote and preserve the fundamental rights of women and children to be empowered and protected." She has been recently called a "literary legend" by Latino Leaders magazine, which named Allende as third most influential Latino leader in the world in their 2007 article. Allende's novels have been translated into 30 languages and sold more than 51 million copies. She has three movies of her books currently in production–Aphrodite, Eva Luna and Gift for a Sweetheart. Her last book is a memoir, The Sum of Our Days. It was published in 2008 and looks at her recent life with her immediate family, which includes her grown son, Nicolás; second husband, William Gordon; and several grandchildren. ↑ 1.0 1.1 1.2 1.3 1.4 1.5 1.6 1.7 1.8 Kerri Allen, Corina Miller, Dalia Socorro, Graeme Stewart, The list 101 top leaders of the Latino community in the U.S; Cover story. Latino Leaders 27 8 (4): 24 ISSN: 1529-3998. June 1, 2007. ↑ 2.0 2.1 2.2 2.3 2.4 2.5 Aida Edemariam, "Review: The undefeated: A life in writing": Often compared to Gabriel Garcia Marquez, Isabel Allende is more interested in telling stories about her own life, her difficult upbringing, marriage and her daughters death. The Guardian (London) - Final Edition. GUARDIAN REVIEW PAGES; 11. April 28, 2007. ↑ Shirley Christian, "Santiago Journal; Allende's Widow Meditates Anew on a Day in '73." The New York Times, Section A; Page 4, Column 3, June 5, 1990. ↑ Veronica Ross, "Sewing didn't cut it for Inés." (Review) Guelph Mercury (Ontario, Canada). BOOKS; C5. March 3, 2007. ↑ International: Chilean government rejects state funeral for Pinochet as thousands queue to pay respects: Body to be cremated amid fears of attacks on tomb: Capital quiet after victory parade turns into a riot. Jonathan Franklin, Santiago. The Guardian (London). GUARDIAN INTERNATIONAL PAGES; 14. December 12, 2006. ↑ 6.0 6.1 6.2 Life at a glance. The Guardian (London). Guardian Saturday Pages; 6. February 5, 2000. ↑ LATIN AMERICA'S SCHEHERAZADE; Drawing on dreams, myths, and memories, Chilean novelist Isabel Allende weaves fantastical tales in which reality and the absurd intersect. Fernando Gonzalez. The Boston Globe MAGAZINE; 14. April 25, 1993. ↑ Allende, heroine 'Ines' are kindred spirits. Javier Erik Olvera. Inside Bay Area (California). BAY AREA LIVING; Home and Garden. November 25, 2006. ↑ 10.0 10.1 This old "House" opened a lot of doors for author Allende; Theater preview. Misha Berson. The Seattle Times ROP ZONE; Ticket; H44. June 1, 2007.